Ocasio-Cortez’s Green New Deal Could Be A Huge Boon For China. Here’s How | Watts Up With That? Anything that makes energy more expensive makes manufacturing more expensive. Wind turbines, carbon taxes, green mandates — all those things drive production to China. Moreover; China recognizes that the insane preoccupation with CO2 by the West is a competitive advantage for them. It’s much easier to win a race if the competition is injured. It’s even better if they agree to break their own leg. Bingo. The cost of all things IS would soar, until our usage dropped as manufacturing fled. Has that Individual done any research into the financial cost to the US, never mind the environmental cost to the US, that this Absolutely Brilliant Idea of hers will entail? No? Yeah, didn’t think so. Leftist ignorance and idealism are appalling, they need to be put down, by any means. When you don’t know how things work, it is easy to have pie in the sky ideas. As has been posted by others here before, it’s OK to have an open mind but not so open that your brains fall out. you must be careful to avoid “Idea Diarrhea” as well. Not by any means, that is the way of the left. These ideas will be put down by exposure to reality. I suspect we have huge supplies of rare earth metals within our own borders. Unfortunately, we lack the political will to utilize them unless we can dig them up out of the ground and refine the ore with a windmill. Rare earth minerals are not actually rare. wind turbines and high-tech weapons. I lost interest in the industry back then. are now mined in the US. the rare earth element supply chain. As I understand it, the mine, in California, was bought by a Chinese company. Unless they jack it up and take it to China, the mine and the ore it produces can remain in the US. If need be the mine can be taken by eminent domain. More to the point is why the mine has been inactive. Opposition by Greens. They may not be owned by the Chinese, but hey are working for the interests of the Chinese. You don’t seem to understand the concept of mining rights. When for example, western companies own vast gold mines in papau new guinea, they fully own it but have to pay taxes.. That’s all. The mine is exclusively theirs and they can carry as much gold out of there as long as they pay duties. Because China has such a large monopoly on Rare Earth metals, it can control the price. These metals are a little like Gold, in that you need to process a huge amount of muck, to extract a little of the metal. If the market price of the metal is high enough, it’ll be profitable. If it’s too low, it won’t be. What China has done, is flood the market & drive prices down, thus making rival producers go bust & shut. When the competition’s shut down, they starve the market & force prices back up. No investor will risk their capital in opening another mine, as China may flood the market at any time & they’ll lose their investment. China creates affordable rare earth elements. What’s not to like? I am a Bic pen tameter, probably. the best “job” I’ve ever had ! to see what I am typing. Nah, you just gotta read it as slam poetry. The reason there are few are earth mineral mines in the US are the environmentalists who oppose the kind of mining required to extract them from the Earth. They’re not rare, just very diffuse, so is takes a lot of dirt and a lot of toxic processing to mine them. The reason we get our rare earth elements from China is not because we lack those elements. It is because China has cheap labor and dangerous working conditions. President Trump slapped tariffs on steel and aluminum on the basis of national security. It appears to have been successful. link He could easily promote rare earth processing in America by slapping on some tariffs. When I was a pup, we worried about national security. There were rules that strategic materials (not just equipment but components like resistors and capacitors) had to have at least two different manufacturers. By mid career, we had an antiquated navigation system that relied on vacuum tubes that were only available from the USSR. It could be argued that Pearl Harbor and Hiroshima were a direct result of Japan not being self-sufficient in energy supply. It could be argued that much of the termoil in the middle east was a result of US not being self sufficient in energy supply. Yes, you’re right, the US has plenty of in-ground REE, but even if mines could be permitted in a reasonable amount of time, the US has absolutely no refining capacity for the concentrated REE-oxide ores that are produced by mills at a mine. Almost all (> 95%) refining (i.e. extracting the pure REE metals) is done in China. So, essentially all REE-oxide concentrates mined worldwide have to be sent to China for refining so that they can then be utilized in the manufacture of magnets, etc. Everywhere is rare earth elements.. However there are only few places on this earth where its economically viable to mine them. Places where it’s particularly rich and abundance. America has one mine somewhere in nevada i think.. However the richest giant ores, tgat damwarf them, are in inner Mongolia, China. That’s just fact. Like vanadium which is also super important for future battery storage, is also found in China the most. Where in America, it is virtually non existant in comparison.. It’s not just about labour but also availability/density levels of the resource. Interesting times and I thought Hillary was nuts…. Hillary is corrupt. Not nuts. She feigns ignorance to hide her lack of ethics when caught, which merely makes her look naive and and nuts. AOC is illiterate and arrogant to the point she doesn’t realize she is stupid even when it is put right in front of her with hard evidence. That makes her a most dangerous kind of ideologue, the kind that supports concentration camps for her ideological adversaries. Her Green New Deal accomplice in the Senate, Senator Markey, though is the one who is nuts. He is old enough to know better. Markey is a whack job just like several other of his colleagues in the Senate. She even made money off the Swiss banks for cutting a tax evasion deal with the U.S. to limit the hit to them on U.S. account holders. In the article photo, the guy between the She Guevara and Markey is Senator Merkley. Merkley has been on heavily on board with this stuff for the last 8 years. I don’t know if he is stupid, nuts, paid off, or thinks this is the best way to accomplish his long range presidential goals (although he is smart enough to know he can’t make it in 2020 & Oregon does not allow him to do it just for show). I think combined IQ of Oregon’s two senators would be near the bottom in any comparison contest between the senators of the 57 States. But – the Oregon voters ‘feel’ like Merkley looks like they imagine a Senator ‘ought to look. Neither on their senators speaks any faster than a kindergartener can understand. Very – slowly – and – deliberately – with – very – few – words – with – more – than – four – letters. Fortunately for the Big Clime Syndicate, supplies of greenium, beliefium, and noncomposmentium remain fairly high – for now anyway. in my lifetime, and I’m 65 years old ! — then I’m wrong about Trump ! Richard, after what I have read in this article, I’m more than willing to believe that “climate change” was invented by the Chinese. Lol! A couple or three years ago, on the site “notrickszone” by Pierre Gosselin, there was a post that the East German communists started this modern-times green alarmist movement. Red became Green and because East German industry was inefficient, shutting it down with reunification allowed (new) Germany to take credit for big strides in reducing CO2. The Kyoto Protocol was written to legitimize this plan, placing other nations at a disadvantage. international treaty which extends the 1992 United Nations Framework Convention on Climate Change (UNFCCC**) that commits state parties to reduce greenhouse gas emissions, based on the scientific consensus that (part one) global warming is occurring and (part two) it is extremely likely that human-made CO2 emissions have predominantly caused it. Travesty is a better word for this, because “hoax” implies a bit of underhandedness or secretiveness. “Global Warming/Climate Change” UN-style is well known. B̶l̶o̶n̶d̶e̶ AOC: Are you sure it’s mine? I just don’t see the Green New Deal as being a viable plan at all. Some Democrats are already saying it is an unworkable plan. 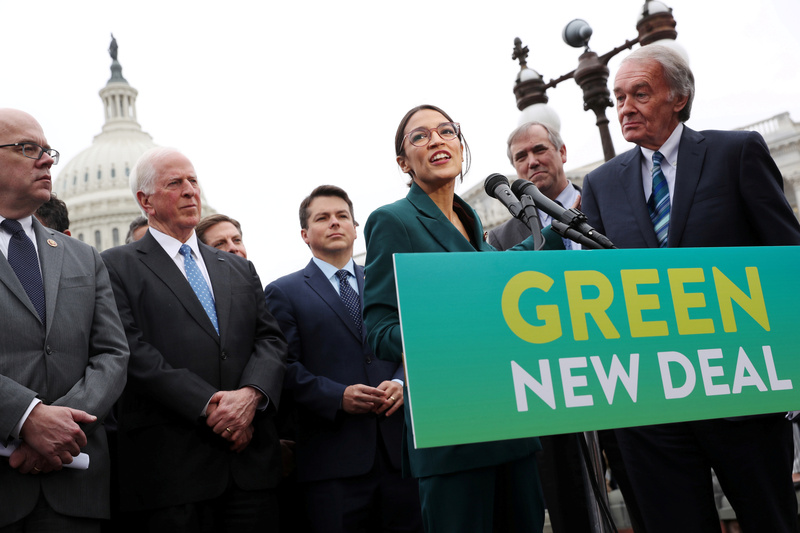 The Democrats will have a Green New Deal bill of one form or another sometime, but it won’t read anything like the first one they put out. I would be real surprised if they kept the banning of airplanes and cows in the deal, along with a whole lot of other ridiculous things they dreamed up to spend money on. The Green New Deal is going nowhere except in the deluded minds of the Democrats. 15.5 gigagrams of neodymium sounds scary … 15,500 tonnes not so much. Still a big pile of metal, but if you buy into the need then we should dig it up in our own back yard. It would be usefull to inform AOC on children abuse in the cobalt extraction facilities in Congo and the ecological devastation caused by neodymium mining in Mongolia. As a green marxist brainwashed activist, she would be very proud to propose to massively worsen this social and ecological disaster. The internet version of Pravda. According to Wikipedia neodymium is found in many places… The main mining areas are in China, the United States, Brazil, India, Sri Lanka, and Australia. Griff, do you support AOC’s Green New Deal? I suspect that the most you will get from Griff about this is that he will claim to be ‘present’. I’ve wondered if Griff and others of such persuasions ever return to read and learn. Pragmatism does indicate that she/he should. Experience indicates he/she does not. Whether or not they return to read they are incapable of learning. 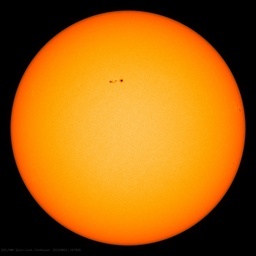 The reason is that to learn means to accept that their political identity is based on a preponderance of misinformation, exaggerations and lies that extends far beyond their parties horribly flawed position on climate science. All agree that “rare earths” are not rare. However, developed societies place restrictions on mining, so competing with child labor and other issues is difficult. Demand~supply~price~regulations: The equations are complex. That’s why your second link — to OZ — is so interesting. I suppose it’s asking too much to rank order the resources of the named countries to see how far ahead China is. Now correct me if I am wrong, but South Korea is one of those places commonly known as “Not America”. Replace the word “China” with “Not America” and the original point being made in the article we are discussing is still pretty valid. Personally as a “Not American” I have a degree of openness towards AOC Great Leap Forward. It will mean that your grandchildren will be about to say to my grandchildren “Thank you sir and madam, please enjoy your stay”. Not sure how cool you guys are with the idea of being the new Bali for drunken foreigners to flash their first world wealth, but AOC is The Boss. She knows how to run a bar after all, so I am sure you will all be fine. It’s almost as though China is paying the Western left to ship their economies to China. When a company moves from the US to China the cost is deducted from US taxes. It is the US taxpayer that picks up the bill. …. and the cost of electricity would skyrocket. Manufacturing would be crippled….. She has no idea. Oh, she does. Crippling the US is the goal, not an unintended side-effect. Politicians and bureaucrats all respond to to the same economic forces in the same way, in any century. The book is worth reading and can be found on the internet. Why is anyone still talking about the GND? Not one Democrat would come out in favor, though they did manage to be “present.” The thing was a silly stunt from the get-go, and sounded like it was written by a 3rd-grader. Total head-smacker to me that so much ink has been spilled over something demonstrably absurd, with serious people filling up the airwaves pretending to take it seriously. Monty Python couldn’t have done a sketch more absurd! The one thing it DID prove as a trial balloon, is the inadequacy of our educational system. All those that voted ‘Present’ are for the GND. They just didn’t want to go on record as supporters of the GND. Does no good to be “for” it if they aren’t willing to “vote for it”. No law ever passed because all it’s supporters voted present. Nobody is so stupid that they can’t see how insane the GND is and I think that it’s more the case of not wanting to be on the same side of an issue as Trump. It’s interesting how a delusional mass psychosis like Trump Derangement Syndrome can have such a detrimental effect on rational thinking. The unintended consequence is that they have ‘jumped the shark’ on the climate change issue, especially given how the current crop of Democratic presidential hopefuls are so vested in CO2 alarmism. Not really. The 43 that voted ‘Present’ are supporters of the GND. They just don’t want to go on record as supporters. Again being “for” it does no could if they aren’t willing to “vote for it”. Voting present doesn’t get legislation you are for signed into law. This is just wrong. Why suspect. Why not check? Rare Earths are widely available, at the right price. They are expesnive to extract from the rocks they are found in. I have some lingering stocks in a proven deposit in Greenland (GDLNF), the USA has significant reserves, as do the Russians (HREEF has an interest). Amost such stocks are in the tilet because the Chinese are cheaper and have enough supply. It appears these rare earths are often linked to Uranium and Gold deposits (for literal reasons, they seem to stick together). To extract them profitably simply requires the right market price, driven by scarcity. e.g. Exploitable reserves are price dependent. There is little interest in exploiting strategic materials when they can be obtained more cheaply by reducing a competitor state’s reserves. However greed enters into this , and short term greed overcomes patriotism very easily in America, unless the government prevents exports, and even then lobbysits pressures can overcome this for a fast Buck, as occurred with natural gas. Clean, low CO2? Export it and burn coal in the USA…. why not? Make Capitalists rich again. I wish the Chinese would limit supply, then my stock might climb out of the toilet. Meh. Why waste time even studying details of such a preposterous plan….. If used in WECs or Motors it is not consumed. It is in one place in the motors/generators and is therefore easily recycled. David – If her scheme is imposed there will be so few people left alive in the West for her wheat flakes to probably be sufficient. Dumb as a bag of spanners and getting help from the rest of the green dems. That’s what I eat for breakfast. Didn’t know you could plant them. The ones I eat are probably too dry to plant. I put milk on them and get them moisturized but never see any sprouts. Maybe I’m buying inactive donut seeds. You got the GMO variety. They don’t grow unless you send a check to ADM. If I was drinking a beverage, it’d be all over the keyboard and screen……. 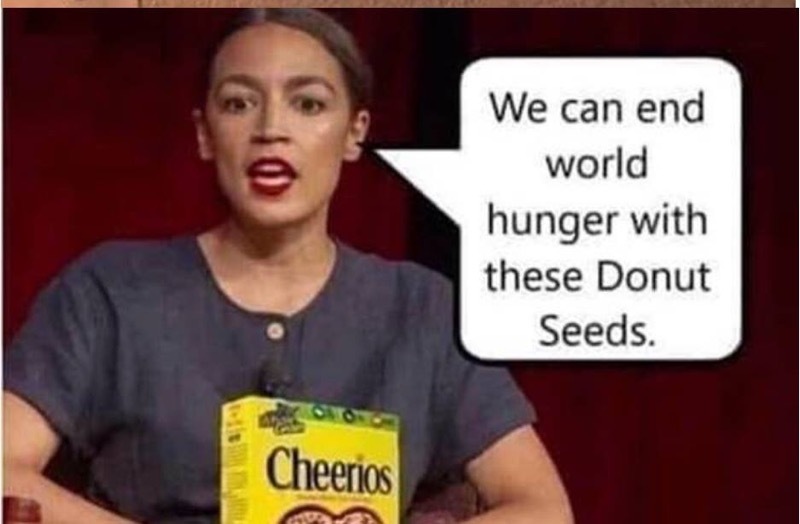 Ummmmgggaaarrrgle (drooling) — donut seeds…..
“Green” as depicted by the media, and living in the typical popular imagination of AOC, is NOT green. Unless windmills, solar panels, and batteries can grow on trees they require a huge environmental impact to manufacture and operate. Proponents are selling a “Green Fantasy”. Want to see my “Molten Unicorn Reactor”? Should be online any day now. “Outsourcing” is another scam like CO2 that was designed to enrich the largest Communist regime in the world. Everyone can see the benefit both have been to China. The lure of “cheap goods” drove outsourcing and it worked until people in donor countries realized without jobs there was no way to pay for the goods. We literally handed China the electronics production and other industries to China which they made profitable based on cheap energy and labor pricing controlled by the government. It’s how they rose to the second largest economy in the world almost overnight. Listening to people from the UN it appears China is the model they want the world to follow and the UN isn’t shy about saying they support them. Gigagrams??? Who on earth uses gigagrams as a unit of measure? Why not simply say 15.5 thousand metric tons? 15.5 kilotonnes ? OO-err, now many Hiroshimas is that ? But gigagrams sounds so much BIGGER, doesn’t it? From now on, I will quote my weight in gigagrams, and my age in nanoseconds, just to show that even a lightweight like me has nearly an eternity of wisdom to offer. It’s all about perception — how to fashion the best illusion, using the best confusion. With labor and environmental arbitrage offered in liberal doses, China is one of the few nations that can legally assure gray technology remains out of sight, out of mind, and viable. I don’t understand why people keep calling her a democrat. I see an old fashioned communist so it does not surprise me that what she is pushing would benefit a communist state. Happy for someone to point out where I am wrong. AOC:Comrade, when the Green New Deal comes you will get a house and a car. YOU:What if I don’t want a house and a car? AOC:Comrade, when the Green New Deal comes you will do as you are told. Andy, she’s not a democrat (IE A proponent of democracy), she’s a Democrat (IE member of the Democratic political party – which has become the far left party in American politics). Many in the Democratic Party are indistinguishable from communists these days. There are definitely mineable rare earth deposits in the US, but of course costs are much higher here; a problem that began not with China but which rather is entirely self-inflicted. When Nixon closed the ‘gold window’ in 1971 it started us down the path of dollar depreciation that has been maintained by the Fed ever since, to the point where people not only expect it but believe it is the correct way to ‘run’ an economy. It has priced the US out of world markets and hollowed out our economy. (What do we have left: we sell each other things, we design things that other countries build for us, and there are still a few things we do better than anyone else (it’s funny the oil industry is so hated because it’s one of those things)). China capitalized on the situation (irony intended), but they didn’t create it. It is simply not possible to have “net zero carbon emissions” in the real world. Since the all future electricity is supposed to be dominated by renewables meaning primarily solar and wind there will always be significant fossil fueled generation to meet reliability requirements unless frequent power blackouts are deemed acceptable. Additionally wind and solar cannot be the primary energy supply for the transportation, commercial and industrial sectors. The entire “net zero” is just complete garbage. Its surprising how fast Urban Myths can kick off and get established..
NeoD. is used where you need a compact and strong magnet = eg actuators of computer hard-disc drives or in headphones or ear-buds and or as a scientific curiosity/plaything. Wind turbines are none of those things. Why NeoD. has come to be used is in part because it sounds all ‘flash’, scientific and exactly the sort of stuff Captain Kirk might shoot off a few photon torpedoes about. And they could do that because not only was there one supplier (them) but only one customer – the taxpayer. Even better it suited the manufacturers of the windmills. They were/are not doing for the goodness of their hearts – they do it to make a profit. There is your actual problem – is anyone talking about that? And the manufacture is compounded by the safety factors that needs to be built in working with these things. Just quickly I found a ‘fishing magnet’ on ebay = NeoD based, 3 inches diameter and 720 grams in weight. Bring that near a sheet of steel and it will attach strongly enough to support a 420kg weight. What if you had 2 of those things near each other and your finger got between them? Easily quadruple that pulling power. You cannot just ‘switch them off’ – they don’t let go no matter how loud you scream. How are you even gonna drive yourself to hospital – assuming your mashed hand doesn’t attach to the dishwasher and or the garden gate on your way out to the car. While wind turbines don’t *need* neodymium magnets, many of them do use them (and not for any of the nonsense you were blathering on about). Permanent magnets systems are used because they can be more cost-efficient, reliable and low-maintenance. Instead of needing electricity to emit a magnetic field, large neodymium magnets are usually used to produce their own. This eliminates the need for some parts that previous generators required and decreases the wind speed needed to produce energy. In that picture, it looks like her brain is over heating and putting pressure on her eyes. 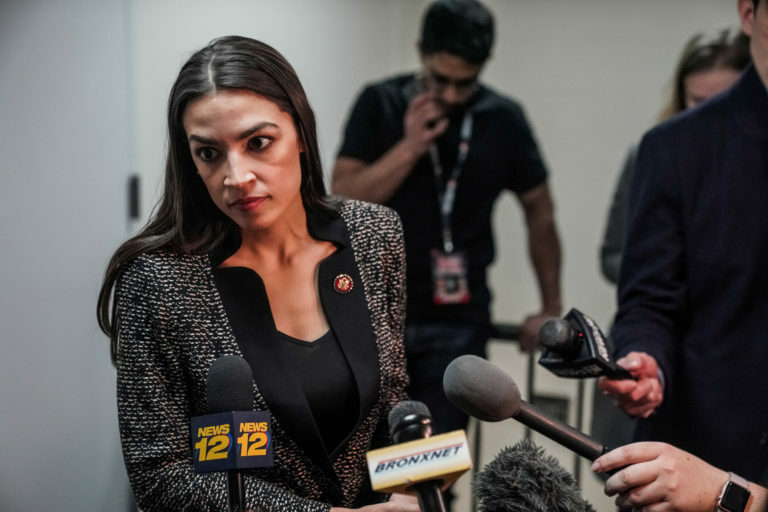 Not much is being heard from Alexandria Occasional-Cortex since the Green New Ordeal went down in flames. This is a pity as she makes Donald Trump sound even more coherent and intelligent when he speaks. Who on earth would use gigagrams instead of tonnes? 15.5 [gigagrams] = 1.55*10^10 grams = 1.55* 10^7 Kg = 1.55*10^4 Tonnes = 15,500 Tonnes. BTW, Google says the stuff is now $1/gram. I guess in one respect, AOC was right. The belief in CAGW will utterly destroy Western Civilization in about 12 years..